The original, patented Roll-Bed® design. 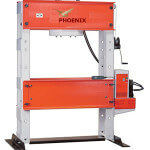 Bed rolls out for easy loading and unloading with a crane or other lifting device. 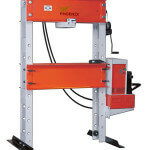 Movable workhead glides easily side-to-side for full off-center load capacity across width of upper frame. 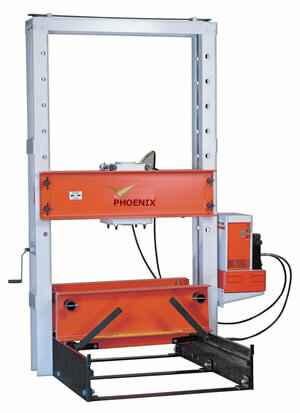 511/4″ x 64″ on 150- and 200-ton presses. Fast approach of double-acting, 131/8″ stroke cylinder is provided by PQ1204S Quiet electric/ hydraulic pump with remote control hand switch. Operator can view work from all sides with fingertip control of cylinder piston travel. Roll-Bed® design Bed glides in or out on bearings to make loading and unloading fast and easy. 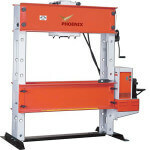 Adjustable lower bed width For secure balancing and centering of heavy jobs. 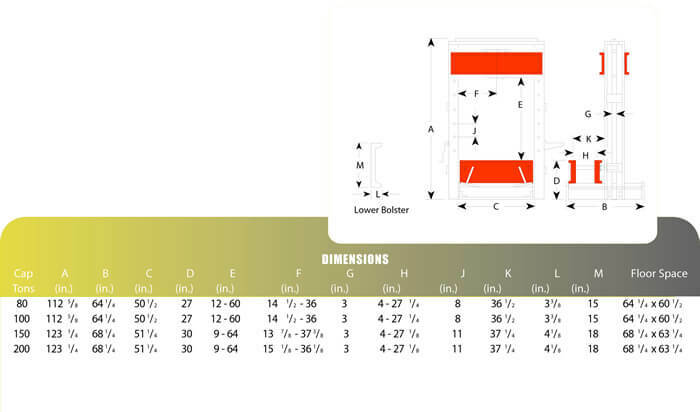 Loosen adjusting bolts to adjust bed from 4″ to more than 27″. 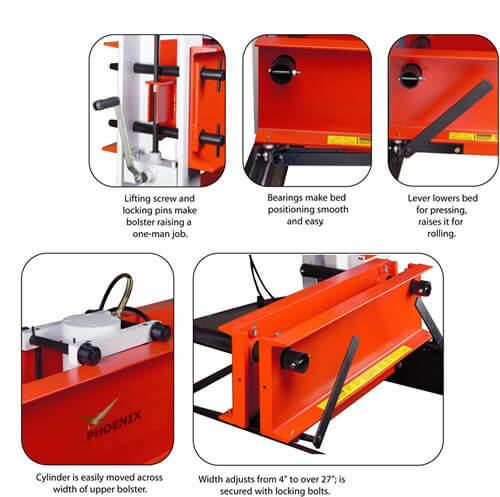 See dimension H.
Movable workhead For off-center pressing jobs, workhead moves on bearings across upper bolster. 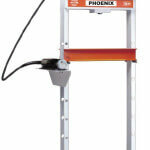 Presses can be used at full capacity, regardless of where workhead is placed. Lifting mechanism Simply turn crank handle to raise or lower upper bolster. Screw mechanism raises or lowers both sides evenly (a heavy-duty 1/2″ drill motor can replace handle for automatic adjustment). Four locking pins hold bolster in place for pressing. 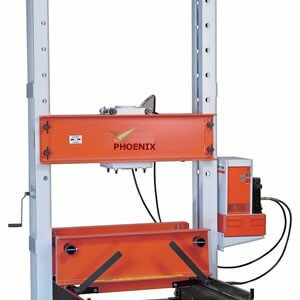 Optional heavy-duty straightening fixtures ?Make straightening jobs easy and accurate to within .004″ Rollers are ball bearing mounted and handle raises or lowers for easy turning of the work.